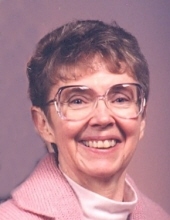 Peggy Ann Woodworth, age 88, passed away of natural causes in Great Falls on April 8, 2019. Burial at Crown Hill Cemetery in Cut Bank has already taken place, with a private family graveside service. The Celebration of Life service will be held on Monday, April 15, 2019 at 3:00 p.m. at First Congregational United Church of Christ, 2900 9th Ave. S. in Great Falls with Rev. Lynne Spencer Smith officiating. Peggy was the only child of Wesley and Marguerite Kiehlbauch. She treasured memories of her happy childhood in Sweet Grass, where her parents ran the local grocery store. She was always proud to recall the beginning of her career as a church musician, at the Sweet Grass Methodist Church when she was only seven, accompanying hymns on Sundays. This formative experience fostered her lifelong love of music and work as a church organist, pianist, accompanist, and piano teacher. When Peggy’s parents moved to their ranch outside Cut Bank, she was given the opportunity to attend high school in Pullman, Washington, where musical opportunities exceeded what was available to her in Montana at that time. At Pullman High, she enjoyed piano studies, as well as choral singing, and performance experience and met her future husband, Charles Woodworth, whom she married in 1950. After Chuck’s ordination as a Methodist minister, they settled in California where they would raise their four children and serve Methodist churches for the next 30 years. Peggy served as organist, Sunday School teacher and led Bible Study classes in her home for many years. After the death of her parents in the late 1980s, Peggy and Chuck retired to Montana, where they served many churches along the Highline, including Harlem, Chester, Trinity, Galata, Devon, Shelby, and Cut Bank. Peggy continued to offer piano lessons, play for church services, and enjoy her dogs for as long as her health permitted. Preceded in death by her beloved husband, Peggy is survived by son Mark Woodworth (Jeanne Dussault), daughters Heidi Owens, Robin and Page (Matthias Krohn) Woodworth; and granddaughter Amy Braun (Darren); and grandsons Sam, Kyle and Seth Woodworth (Meagan Shipley) with great-grandson Arlo. In lieu of flowers, the family requests that donations be made in Peggy’s memory to the two charitable (501 (3c) organizations who were so helpful in finding a loving home for her dogs. Bright Eyes Care and Rehab Center, PO Box 1498, Choteau, MT 59422; and Northwest Samoyed Rescue, 3646 143rd Ave SW, Tenino, WA 98589-9607. To plant a tree in memory of Peggy Ann Woodworth, please visit our Tribute Store. "Email Address" would like to share the life celebration of Peggy Ann Woodworth. Click on the "link" to go to share a favorite memory or leave a condolence message for the family.